Hold-It storage and organization system comes complete with 1 small aluminum rail (20 inch/50cm), 1 Large (30-40mm) Hold-It and 2 Medium (20-30mm) Hold-It. Ideal for organizing handle based items and a variety of different shaped objects. Hold-It's soft rubber grip will not damage handles or tools. The system is simple to install, durable and can be used for indoor or outdoor purposes. Great for use in garages, sheds, closets, barns, sport lockers, utility vehicles, boats and much more. We've reinvented the standard bungee cord, with our KnotBone Adjustable Bungee. With carabiner clips instead of open hooks at each end, it not only attaches to your anchor points, it locks there. Instead of elastic that loses its stretch over time, the KnotBone Bungee has a durable, high quality cord that threads through each end, adjusts from 48" to 10" in the #9 size and from 28" to 6" in the #5 size. Once you have it adjusted to the right length, secure it in place with a simple wrap-and-lock motion. We've even added small self-clipping plastic caps to the cord ends to keep them in place once you've got your load secured. No more pulling, stretching, and re-hooking to get the tension you want - job after individual job, the KnotBone Bungee stays right where you attach it, pulls securely to the exact length you need, and locks there. Designed to lock securely into place with a simple pull of a cord, the Nite Ize CamJam is an easy, knot-free way to tighten, tension, and secure lighter loads of all kinds. Made of sturdy, durable plastic, it features a carabiner clip with a stainless steel gate on one end, and a rotating, ridged cam mechanism on the other. Simply anchor the carabiner to any hook, D-ring, or loop, and feed your cord through the cam until you've reached the desired level of tension. Pull firmly, and the cam locks into place and stays that way until you release it by rotating the cam. Easy to adjust and readjust, the CamJam is made to use and reuse hundreds of times, in hundreds of ways. Clipped to rings and hooks, it's excellent for hanging and securing tarps, tents, blinds, gear. Create a loop by clipping it to one end of the cord and pulling the other end through to bundle sleeping bags, blankets, cut brush, or wrap light loads to wheelbarrows, wagons, dollies, bikes, and boats. Gear Tie 18 Inch. 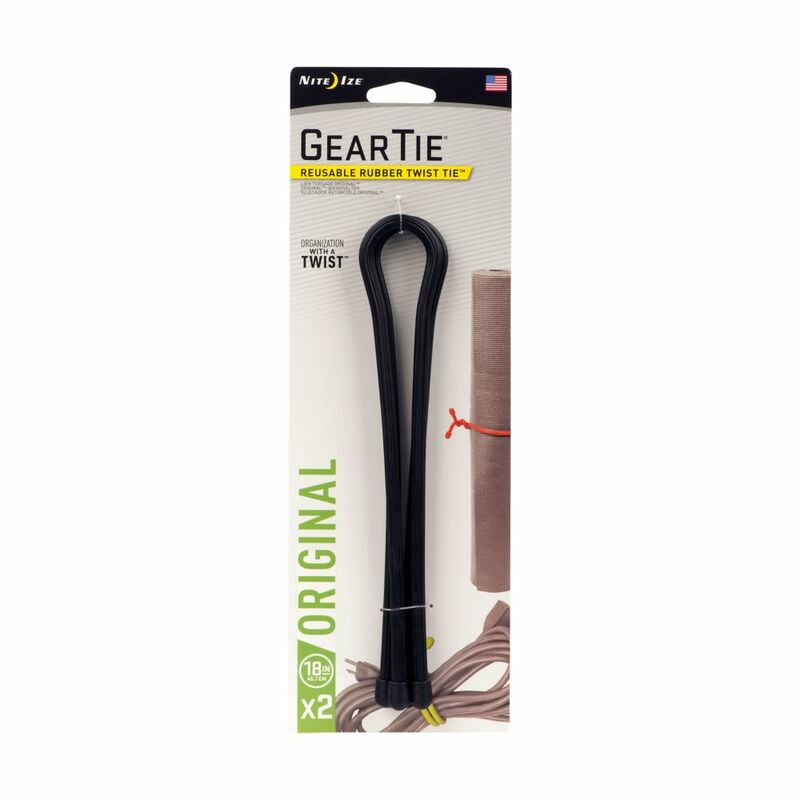 2-Pack Black The 18" Nite Ize Gear Tie is the perfect size to wrap and organize medium-to-large appliance cords and wires. Keep your jumper cables, extension cords, dog leashes, and larger electric cords neat and untangled with a quick simple twist. The 18" Gear Tie is also great for looping and hanging lightweight tools and lanterns - and reusable nature makes it easy to reposition and adjust conveniently. Available in packs of two. Gear Tie 18 Inch. 2-Pack Black is rated 5.0 out of 5 by 9. Rated 5 out of 5 by Big_Rod from Gets the work done I got my first pair this year and they work great. they are easy to work with and come in handy in any office space. Rated 5 out of 5 by John from The Best!!! I got my first set at the Modern Marine Expo at Quantico several years ago. Since then I have used them to hold down four 25# weights that hold down my vendor tent at several different farmers markets. They work better than just about anything that I have tried before. Rated 5 out of 5 by Leigh Nagy from I was given a few sizes of ties at the Shot Show in Las Vega I was given a few sizes of ties at the Shot Show in Las Vegas. They are simple to use and extremely handy. A great product to replace the use of twist ties and they last longer! Thanks for the sample! I will definitely pick up more of these. Rated 5 out of 5 by Tom M. from I use one Gear Tie daily to open our outer chicken coop door I use one Gear Tie daily to open our outer chicken coop door and one to hang lettuce for the chickens to peck in the coop. We also use them all over the house, garden and with all our gear. Thanks for making great products! Rated 5 out of 5 by Diane from I've used these to tie up extension cords and garden hoses, I've used these to tie up extension cords and garden hoses, but I think my niece showed me how useful they are for busy moms. She has 1 1/2 year old twin boys, who are very curious and can use their little hands to open everything. She used the rubber twist to tie to "shut" the cabinet doors since a regular baby cabinet lock wouldn't work. Items stored in the cabinet are safe from them! Rated 5 out of 5 by Vicaral from Great Tie! These rubber twist ties are amazing. You can secure things together easily and take them apart and re-use them over and over. Strong and durable. Get them a little longer than you think you will need to make it easier to twist them. Rated 5 out of 5 by Grogan14 from Convenient for a lot of things Got a pack of these in my stocking this year. I attached a rare earth magnet to the end of one, using it as a retrieval tool to grab the end of the jack chain that I often fish wiring down wall cavities with. Using the other to keep an extension cord bundled. They seem to be holding up quite well thus far. I can think of so many things that they could come in handy for, and will be buying more.